Ho, ho, ho! The holidays are here and we’re all preparing to gather ’round the old Amazon Echo to celebrate the miracle of AI with our loved ones. With its newest update, Alexa hosts Santa Clause who’ll help Echo owners find the perfect seasonal music. Amazon’s virtual assistant now responds to “talk to Santa Claus” across all supported devices. When prompted it’ll summon Santa himself to spread holiday cheer by asking what kind of Christmas music you’re interested in listening to. The jolly one even hosts one of the stations, North Pole Radio on iHeartRadio. Is Santa Claus real? / Do you believe in Santa? / Is there a Santa? Where does Santa Claus live? / What is Santa Claus’ full address? What can you tell me about Santa’s reindeer? What do you know about Rudolph the Red-Nosed Reindeer? 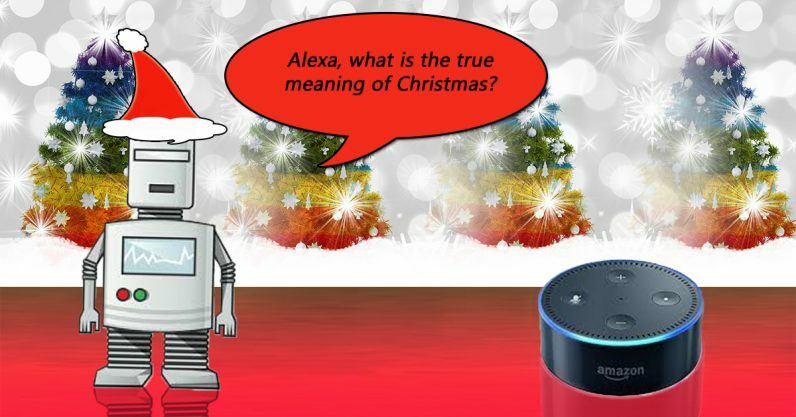 Kids should get a kick out of interacting with Alexa and Santa, and if parents get tired of hearing the same thing over and over there’s always the world of skills. The “NORAD Tracks Santa” skill is a fun way to stoke excitement leading up to Christmas Eve. Another nifty skill worth enabling is “Santa Claus,” which will help you determine if you’ve been naughty or nice this year. Also just released is a “Holiday Song Quiz” which is, as you might have guessed, a holiday version of the popular “Song Quiz” skill. With it, you and your friends and family can compete in a musical trivia competition. If you’re feeling a bit “bah humbug” this year perhaps you just need more smart speakers. For optimum holiday cheer we recommend getting at least ten, placing them all in the same room, and playing a different Christmas song at maximum volume on each. Or you could opt to keep your sanity.